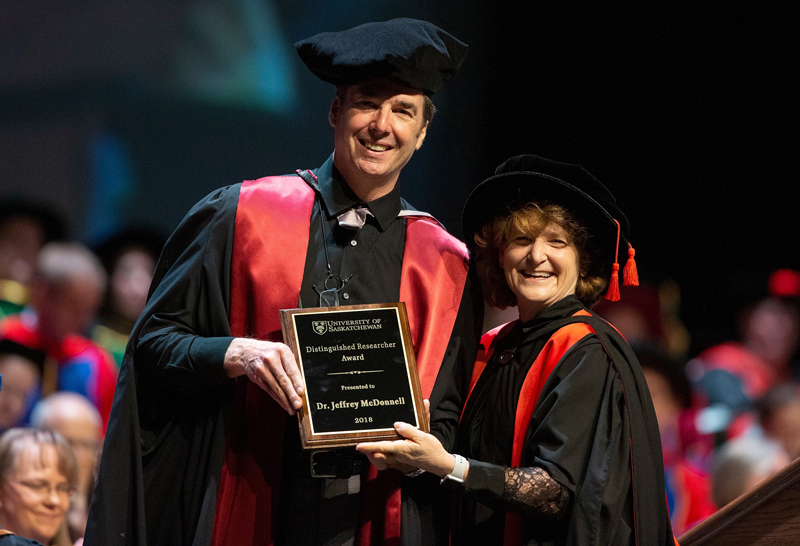 The professor with the School of Environment and Sustainability and associate director of the Global Institute for Water Security was presented with the university's highest honour for faculty research at Fall Convocation. The Distinguished Researcher Award recognizes a faculty member’s contributions to scholarship through the creation, expansion, and critique of knowledge. "I am bursting with appreciation for receiving this award. Of course, the credit rests squarely on the shoulders of my graduate students, postdoctoral fellows, and technicians," said McDonnell. "I consider it a group award." The world’s most cited field hydrologist, McDonnell’s work has had major and wide-ranging impacts in the field of hydrology. His research has fundamentally advanced the global understanding of how landscapes store and release water, which is critical to predicting the impact of climate change and land use on water resources. "It’s great to be at the U of S and a professor in the School of Environment and Sustainability where research is so valued," said McDonnell. "I’m fortunate to be associated with the Global Institute for Water Security, a growing force in the international water world." McDonnell has conducted a wide range of runoff-related studies worldwide, including in the United States, Chile, China, Japan, New Zealand, Sweden, and the United Kingdom, and his work has led directly to an array of new models and theories that have transformed the field. Further, McDonnell’s work has shaped and inspired the emerging field of hydro-ecology by bridging what were previously considered distinct disciplines. Over the course of his distinguished career, McDonnell has published 275 peer-reviewed journal articles, two edited book series, and six edited collections, and has been cited over 20,000 times. "After 30 years as a professor, I feel as though I am just now starting to hit my research stride,” said McDonnell. Beyond his outstanding work as a researcher, McDonnell currently serves as the president of the American Geophysical Union Hydrology Section, the world’s leading hydrological organization with more than 7,500 members. He is also a dedicated and highly regarded teacher and mentor who is strongly committed to advancing the careers of his team members. McDonnell has trained more than 65 graduate and post-graduate students, many of whom have gone on to achieve considerable career success and become influential scientific thinkers in their own right. He has also developed and led international short courses in Europe and South America as well as an isotope hydrology course for the UN’s International Atomic Energy Agency. As of 2015, McDonnell has contributed a series of articles to the journal Science that aim to help new faculty members achieve career success. "I have a terrific team around me in my research group. I feel like a conductor leading a group of world-class musicians in a scientific orchestra. We have fun doing what we do," said McDonnell. A Fellow of the Royal Society of Canada, the Geological Society of America, the American Geophysical Union, Royal Geographical Society and the International Water Academy, McDonnell has received the largest number of prizes and honours ever awarded to a Canadian hydrologist. His honours include the 2016 IAHS-UNESCO-WMO International Hydrology Prize, Dooge Medal, which is one of the world’s most prestigious recognitions for excellence in the field of hydrology. "My hope for the future is to grow my internationalization efforts and to work to emphasize the 'Global' in GIWS. I want to connect everyone working in the water area at the U of S with partners around the world."